This is a painting that I began last year, put aside and then worked on again recently with a fresh outlook. I think that all painters have paintings like these. Either we were too busy at the time working on other paintings, or somehow lost interest along the way, or otherwise decided that the time was not right to bring it to finish. It’s been hanging where I see it whenever I pass by. Enough repetitive glances and I start thinking … what if I tried this, or that? What if I corrected this challenging passage? What if I tried a different color here or there? Or added some different shaped branches? The fact is, until the time that a painting is signed sold and on its way to a new home, any one may be a “work in progress” and as our experience and vision changes, so does the way we express ourselves. And just as the natural world changes and morphs with time and the seasons, so do we. That is incredible but I say that about all your work . . . Very nice. I saw your before and this present one. You inspire me to keep going. Thank you. Very nice painting. What a thoughtful post on EDM today. Art is much like life, isn’t it? We get better as long as we keep showing up and giving it our best, listening to our teachers and learning from our mistakes. You touched me today and taught me something valuable. Ohhh–and I love the newer smarter version! Wow! I keep thinking about the fires in Santa Barbara and elsewhere. It’s so devastating and then I think that you must have painted some pictures from these areas and I feel like a little has been preserved at least. Timaree, I have been thinking the same thing myself. 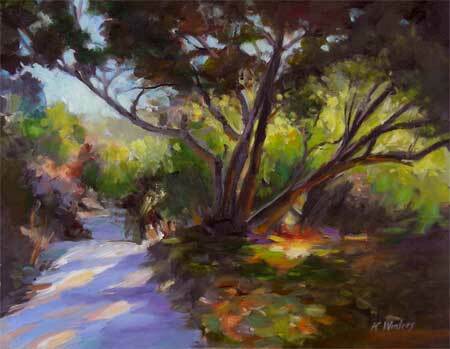 I should probably find some of those Montecito paintings and repost them. I know that some were in the area. I also have a ton of photos taken around the fire area. This will inspire me to paint to preserve it. Karen, this is beautiful. You know color is a favorite of mine. Nice work. The colors are stunning, Karen! LOVE the darks in this… they bring out the wonderful colors. Your Santa Barbara painting reminds me of how fortunate so many of us are to have escaped (so far) the conflagrations surrounding us. California is beautiful, but it comes with a price. I admire your efforts on behalf of the Red Cross. I really love the shadows onthis one – it makes me want to walk down that road. This a a favorite of mine – the light contrast is wonderful, especially in the light greens in the righthand side. The tree looks so strong against the background. I saw this on Flickr, by the way. so. Remember that your style needs to be entertaining, useful and motivating.